It is a work in which I explore the state of hysteria. The first piece, “La Torre”, is a 3D animation presenting a claustrophobic space in which some objects rotate on themselves on a chequered floor. 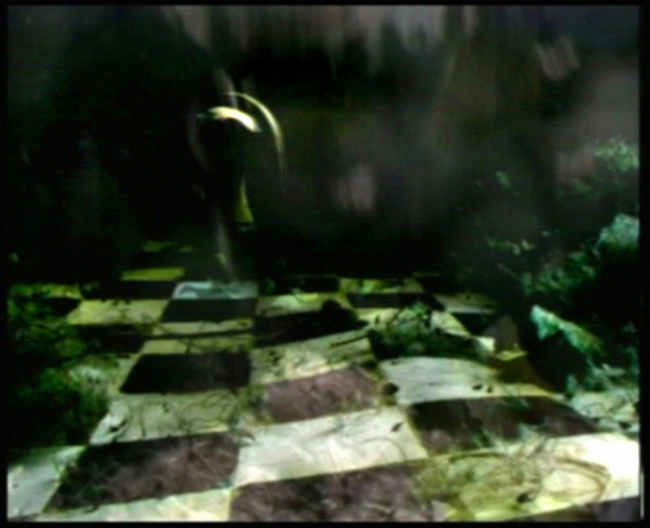 In this piece there is an atmosphere of emergency and “loss of control”: the doll’s head spins on itself faster and faster in this dark space where a sense of prisony and oppression is staged by the absence of windows or doors, and a first stage of hysteria here is identified with the worms crossing the room. The theme of hysteria manifests more overtly in the struggle of the second section “Le Formiche”, in which a succession of images of shaking hair, falling flowers, black paint on canvas, and frenetic body movements inhabit the screen. With the obsessive shaking of the head of a real performer, this part also represents a moment of denial but at the same time a process of purification. The third part of the trilogy, “Lo Specchio”, revolves around the theme of death in a settings very similar to the first piece “La Torre”, just this time the atmosphere in the room with the chequered floor has changed, because the struggle and the tension are now gone. Also the light is different, from night it has become day, the sunlight reached the room as if a window finally opened up in it. While some dead flowers keep falling from the sky/ceiling together with fragments of mirror making a dry sound, everything else is unmoving until we see an outburst of rain: the sole element that can clean and restore hope to the sense of anguish of the entire film.